Who wants to be a five star billionaire? And is that a stupid question? Is it a stupid question to ask in one of the new headquarters of global capitalism, Shanghai? Is it a stupid question when addressed to migrant workers? What about when addressed to those born into wealthy families? And if it’s money you’re after, what would you be prepared to do to win it? Trade your youth and beauty for marriage to a rich man you didn’t love? Sing inane Mando pop for inane teenage girls? Bully a poor man out of his home, so your family could go ahead with plans to redevelop the area? Lie, cheat, re-write your own history, or what? These are some of the questions raised by Tash Aw’s Five Star Billionaire, published by Fourth Estate, and available in both paperback and e-book formats. It concerns five Malaysian-born Chinese, all now returned to China. Phoebe, poor and poorly educated, knows what she wants: money, with a man attached. She is addicted to so-called self-help books, and comes across Secrets of a Five Star Billionaire. Walter, the (supposed?) author, may or may not be involved in cons worse than those of the self-help industry, and may or may not value vengeance above money. Gary won a TV talent contest, and became a pop star, but now he’s finding fame and adulation are not all they are cracked up to be. Justin, the adopted son of a property tycoon, is suffering a nervous breakdown. In her youth Yinghui got dumped by Justin’s brother. Now she’s a businesswoman, but perhaps she’s not as savvy as she seems? These five overlapping stories, rooted in Malaysia, but now unfurling against the backdrop of Shanghai’s pell-mell pursuit of capitalism, between them raise questions not only about our relationships with place, with luck, good and bad, and with money, but also about our relationships with our own selves: about the roles of truth, lies, fantasy, and reality in constructing our identities. They raise also the question of whether or not we can ever truly reinvent ourselves as our circumstances and our ambitions change? As for answers, Tash Aw mostly leaves these hanging, or else he suggests that answers might conflict: by the end, some of his characters do seem on the verge of forging new versions of themselves, and others seem unable to cope with the new identities they’ve recently been trying out. None of this is to say Five Star Billionaire is a philosophical treatise. It does what novels do: it asks us to slip into the characters’ skins. The author does not take sides: all the main characters invite our sympathy and understanding, even when, perhaps especially when, they're being manipulative, and exploitative. Five Star Billionaire is a great read. Once you start it I doubt you’ll put it down. 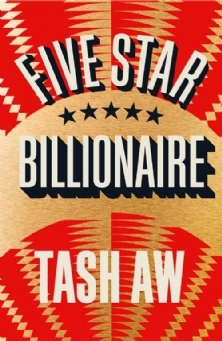 If you have read Five Star Billionaire, please post with your opinions.